WARNING! If you are family, you might want to pass on this one! It’s definitely not my usual PG rated post 🙂 Read at your own risk! Holy smokes! What a weekend! VEGAS BABY! Last weekend the girls and I had my final hoopla before I walk down the aisle. 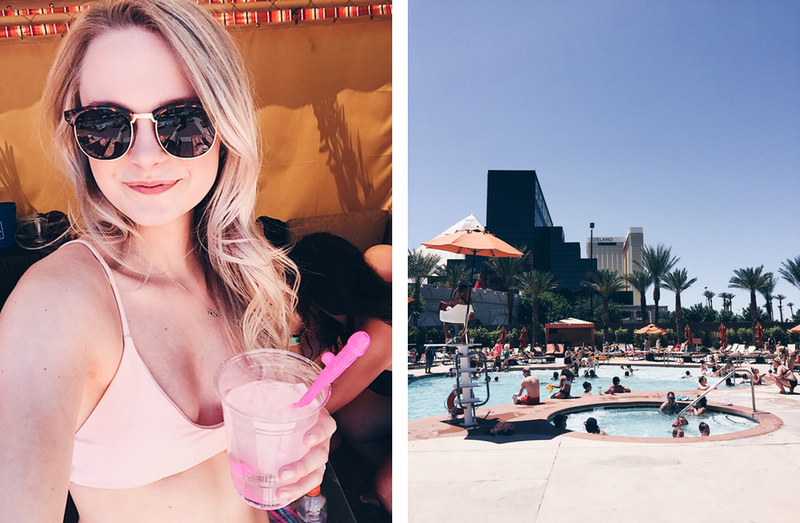 Initially we were planning for a more low key trip (something more local) but the more I thought about it, the more I realized that you only get ONE bachelorette party! I might as well live it up and experience the real deal. And what better place to do that than in Vegas!? We were super lucky to have the nicest stewardess on our flight in. She noticed I was wearing my “Bride to Be” sash and gave us ALL our drinks for free! We cleared the plane of the champagne and did some damage on their wine selection as well 🙂 Lets just say we were feeling pretty good by the time we landed. My mom was lovely and rented us a cabana for the Saturday which was so awesome! Let me tell you, when you are accustom to living in a rainy city most the year, we were roasting in Vegas within a few minutes. We were more than thankful for the ample amounts of shade that the cabana provided us. Plus, with all the liquor flowing from about 10am, it helped us from becoming sun stroked and drunk by mid day. Since most of what we were drinking was not water, the shade was much needed. As you can see, the girls did an amazing job with the decor. My sister hand made the banner across the front of the cabana (above), and they even provided me with stagette themed straws (pictured above), as well as phallic shaped drink cups and candies! We definitely got a few strange looks from people. 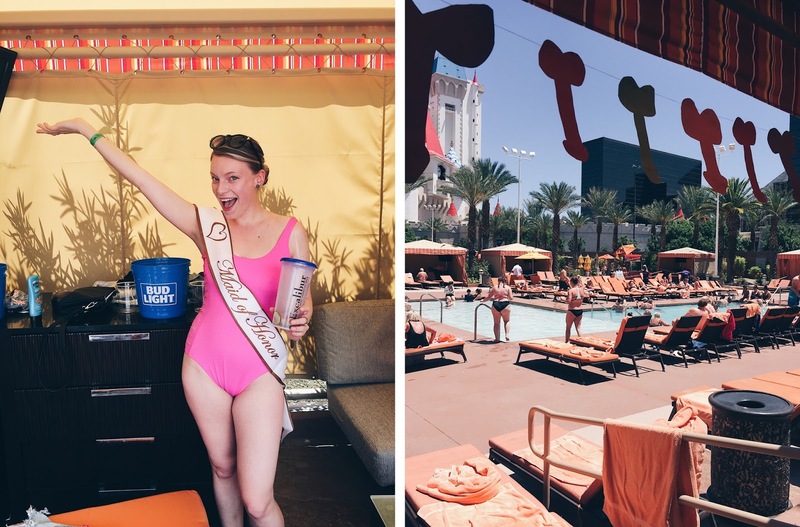 The bridal party in our sashes – pre drinks and pool. We ended up wrangling in 9 of my closest friends to join in on the madness. 2 of which flew in for only 24 hours! They are troopers! I don’t know if I could do that myself! Since there were a few that were only in town for a very short time, we made sure to make the most of the day and night! The party really started as soon as the 24-hour crew showed up. Even though there is a huge water smudge in this one, I had to include it. Bubba kills me with her soaked sash and sideways hat – haha! My sister, the hippie of the family, really wasn’t sure she was going to like Vegas. She was more going along with what the rest of the group wanted to do. But turns out, she was the life of the party and loved it! While the rest of us were feeling sluggish from the night before and having trouble getting started with the day, she was sipping on her giant mojito and dancing by herself in the cabana! Who knew a hippie would fit into Vegas so well! Gotta get that perfect “jump” shot. I had been trying hard to preserve my sash for the evening by not spilling drinks or getting food on it, but once my sister told me they had bought a back up, I went for it and made it part of my ensemble for the day! It actually survived all the hours in the pool very well! Bubba gnawing on her naughty straw. She was trying to get it into her giant mojito drink. The pink straw is just so much more fun than the regular one! Make sure to stay tuned for pictures of what we did in the evening. It was a ton of fun! I was dying to go again the next day but I held off – haha! LIFE IN FRANCE UPDATES – MOVING AGAIN!!! Hope this place turns out good. It’s great that this venue offers services such as catering, lighting, tables and chairs, table linen and parking. I am here to choose event venues Chicago for my event, glad to know that they do not put any restrictions regarding music played. Where is the pink and tropical print bikini from? It's so cute!